What are your views? A management plan for this conservancy is currently under development; you are invited to participate through the management planning web page for this conservancy. Click here to go to the management planning section. 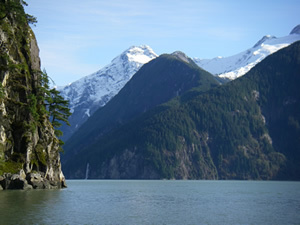 The Hunwadi/Ahnuhati-Bald Conservancy is found midway up Knight Inlet, on the western and eastern sides of this fjord. The conservancy protects the two large, undeveloped watersheds of the Ahnuhati River and Kwalate Creek. Knight Inlet’s glacial waters, steep shoreline cliffs and waterfalls add to the spectacular scenery in the conservancy. The steep-sided valleys of the Ahnuhati River and Kwalate Creek also provide angling and other recreational opportunities. The two watersheds and Bald Peak were identified for consideration as a protected area during the Central Coast Land and Resource Management Plan planning process. Following Government-to-Government discussions between the Province and First Nations, the central coast land use decisions (February 7, 2006) confirmed that the areas would become a conservancy. These areas were legally designated as the Hunwadi/Ahnuhati-Bald Conservancy in Spring 2006. See News Release for more information. The conservancy is located on Knight Inlet, 100 km east of Port Hardy, 80 km north of Campbell River and 200 km northwest of Vancouver. Cultural Heritage: The Hunwadi/Ahnuhati-Bald Conservancy is within the traditional territory of the Da’naxda’xw Awaetlala First Nation. A number of cultural features in the area provide a strong indication of the historic occupation and presence of the Da’naxda’xw Awaetlala First Nation in the area now covered by the conservancy. Wildlife: The intact nature of the two main watersheds in the conservancy makes it particularly important from an ecological perspective. The conservancy supports old growth forests with healthy populations of salmon, grizzly bears and marbled murrelets, among other species. Visit the Hunwadi/Ahnuhati-Bald Conservancy management planning page to provide your input on the management plan for this conservancy.